Submitted by Dan Dooré on Wednesday, May 16, 2018 - 20:14. 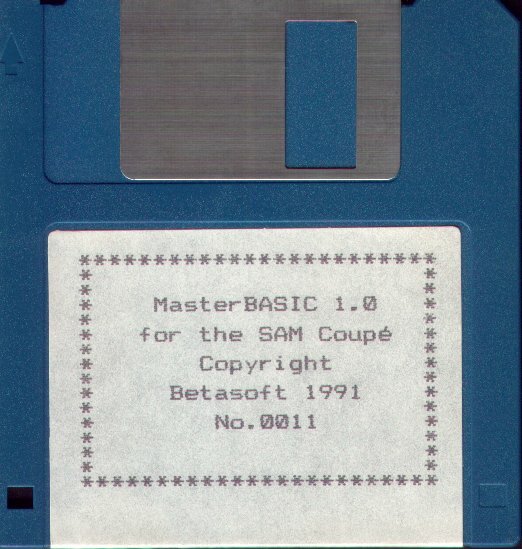 In the same was that MasterDOS was the update to SamDOS then MasterBasic was the same to Sam Basic . This program provides major enhancements to the SAM Coupe’s editing, data-handling, sound, graphics and printing capabilities. I’ve already got a BASIC on my Sam, why do I need a new one? A-ha! It’s not a new BASIC at all, but rather an Extension to the one you’ve already got, as well as doing up your DOS slightly, and generally improving things. Okay, I’ll go through it’s features one at a time for you, and you can see what you like the sound of. Okay, for a start we have options to move the cursor left and right by a whole Word (deliminated by spaces). There is also a small buffer, allowing you to recall the last few lines you have typed in. There is the option to join and split program lines. There are several commands that allow you to search through the program, and to alter references (i.e. variable names). You can search through the program, calling lines in the edit buffer that contain the reference, or print the line numbers of each line containing the reference. You can now trace through your program, either a line at a time, or a line every so often. When tracing through a program, the line and statement number are shown at the bottom of the screen. You can now recall a string to be re-edited. ie if you have INPUTed a long string, and then noticed an error, you can recall the string and change it. There is a very nice SORTing command, that allows you to do all sorts of sorting, using different parts of the string to sort by. You can join strings and string arrays together, as well as selectivally deleting parts of them. There is quite a nice command for searching String arrays, simular to INSTR in many respects. There is a USING$ command to allow formatted output. It is also possible to use strings to store numbers in, using up less memory than the number in it’s normal form, especially if you don’t nee much accuracy. Improved PUT and GRAB, including the ability to swap the PUT data with the bit of screen it is replacing. Copy Screen, alter displayed screen halfway down the page. Addition set of UDG’s for BLOCKS command. A speccy coloured CLS command. More flexible CSIZE command (upto 248*173), scaled in units of 8. Interupt driven printing, Seriel Input/Output, More flexible DUMP command. The ability to ‘HIDE’ sections of basic. These are safe from NEW, and LOAD, and don’t get SAVED. Ideal if you have a set of useful functions that you often use. Some more EXIT commands:- EXIT PROC, EXIT DO, EXIT FOR. File Compression, a command to save the DOS file, faster MERGE option (for certain conditions), faster DIR. 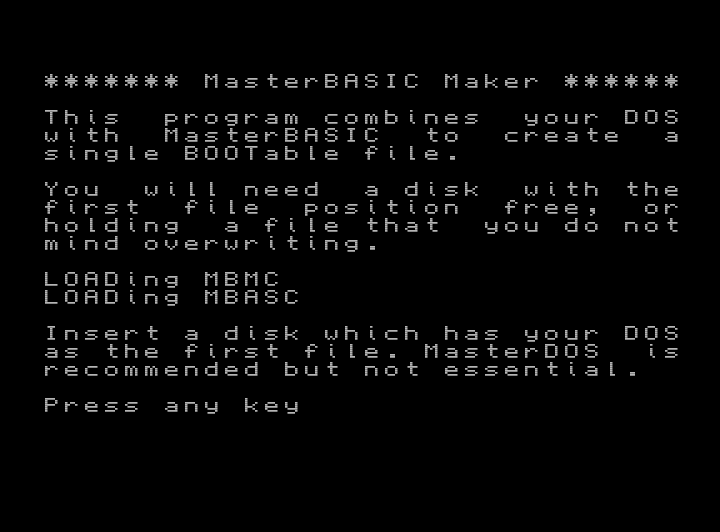 MasterDOS Specific - Faster RAMDisks, Alter Device numbers directly (without poking DVARS), Alternative syntax for COPY etc (replace TO with a comma), Additional FSTAT’s, and more. A couple of other improvements, and new commands are also available, as well as a load of XVAR’s (MasterBASIC System Variables). There is a lot in there, though I imagine quite a bit of it you may not actually use, I know I don’t. I find bits of it useful, but it’s probably worth trying to decide how much you’d use before you rush out and buy it. Very good though, and the Editting/Debugging stuff is very useful.